This chapter covers information on basic techniques of sea survival, evasion, land survival and escape, as well as the code of conduct. Keep in mind that thousands of sailors from around the world have survived a ship’s sinking in both wartime and peace time. • If you have to abandon the ship, you should muster at your abandon ship station (if time permits). Bearing and distance to the nearest land, sea and wind conditions, and water temperature. • Learn all escape routes from various locations throughout the ship. • When going over the side, it is advised that you go fully clothed so you have protection against the effects of the sun and salt water. • Normally, you should leave from whichever side of the ship is lowest in the water, unless the propellers are turning, then leave from the bow. • Leave by the windward side whenever possible. • Never dive, and do not jump unless you have to. • Get to a life boat as soon as possible, and above all remain calm. • You may have to swim a long way to reach a lifeboat. 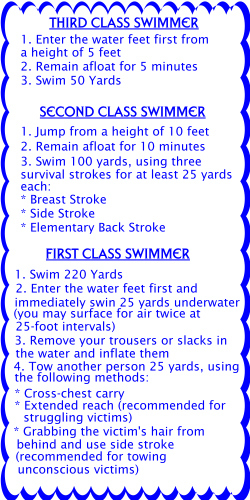 If you check out the chart below, it shows that a first class swimmer has the best chance for survival. • If you have to swim into oil that isn’t burning, save your preserver to use as a raft. Keep your face above the surface so you can avoid getting oil in your eyes and mouth. You can use your white hat, trousers, mattress cover, sea bag, laundry bag, pillow case. You will need to trap air in these items and keep them wet to reduce the loss of trapped air. 1. The inherently buoyant preserver (vest type) is designed to support you and keep your head out of the water. You can stay afloat for many days using the inherently buoyant preserver. 2. The lifeboat presents the greatest chance of survival. It contains food, water, and provides shelter. • The Navy uses two types of life preservers. • The inflatable type is made of lightweight, neoprene-coated nylon. You can blow it up by mouth or by using a CO2 cylinder. It is equipped with a lifting harness, a waist belt, pin-on light, and a wooden toggle with a line for attaching yourself to a liferaft or another survivor. • Check the pin-on light (small watertight flashlight) battery at least once a week and replace the battery at least every 6 months. • Inspect your inflatable life preserver every time you put it on and at least once every month (when it is in your custody). • Survival kits in the large boats are designed to sustain 15 to 20 people for 5 days on regular rations. • The rations are based on an allowance of one packet per person, per day. • Do not consume any food or water for the first 24 hours. • With water, a person can survive 4 weeks or longer without food. • Without water, death will most likely occur in 8-12 days. Normally, even in cold weather, you will need about 2 quarts of water a day. However, because of inactivity and lack of food, you can survive on as little as 6 ounces a day in a life boat. • All sea birds are edible. Nearly all forms of sea life are edible. Each life boat has a fishing kit. • If you fall overboard, the most important thing to do is to stay calm. Do not swim after the ship, you will only exhaust yourself. • If sharks are in the area, float on your back, using as little arm and leg movement as possible. • In water colder than 75 degrees F, you can face hypothermia. • Establish a chain of command. Good leadership lessens panic, confusion, and disorganization. • The best crude sources to find direction are the sun and the stars if you know how to use them. • When you are trying to evade the enemy, experience has proven that the most difficult route is frequently the safest. • Note: page 15-25 has an entire page on evasion travel. • Avoid all contact with people, unless you cannot proceed on your own because of illness or lack of food, and only then seek out native assistance. • The armed forces Code of Conduct directs that you begin planning your escape the minute you are taken prisoner. • There are 6 articles in the Code of Conduct. Article I- I am an American, fighting in the forces which guard my country and out way of life. I am prepared to give my life in the defense. Article II- I will never surrender of my own free will. If in command I will never surrender the members of my command while they still have means to resist. Article III- If I am captured I will continue to resist by all means available. I will make every effort to escape and aid others to escape. I will accept neither parole nor special favors from the enemy. Article IV- If I become a prisoner of war, I will keep faith with my fellow prisoners. I will give no information or take part in any action which might be harmful to my comrades. If I am senior, I will take command. If not, I will obey the lawful orders of those appointed over me and will back them up in every way. Article V- When questioned, should I become a prisoner of war, I am required to give name, rank, service number, and date of birth. I will evade answering further questions to the utmost of my ability. I will make no oral or written statements disloyal to my country and its allies or harmful to their cause. Article VI- I will never forget that I am an American, fighting for freedom, responsible for my actions, and dedicated to the principles which make my country free. I will trust in my God and in the United States of America. • Review Chapter 15 of the BMR.